This is a very quick and easy dinner to throw together, especially if you have your favorite homemade spaghetti sauce stashed in the freezer (nevermindthefacthatIjustgotlaidoffanddon’tneedtimesavingrecipesrightnow). And if you make the ricotta in the morning (or even use store-bought) then you are way ahead of the game! And pssst, did you know making your own ricotta is super easy? I sure didn’t! Meanwhile, cook the sausage in a large skillet (cast iron if you have one!) until cooked through. Drain any grease, if necessary. 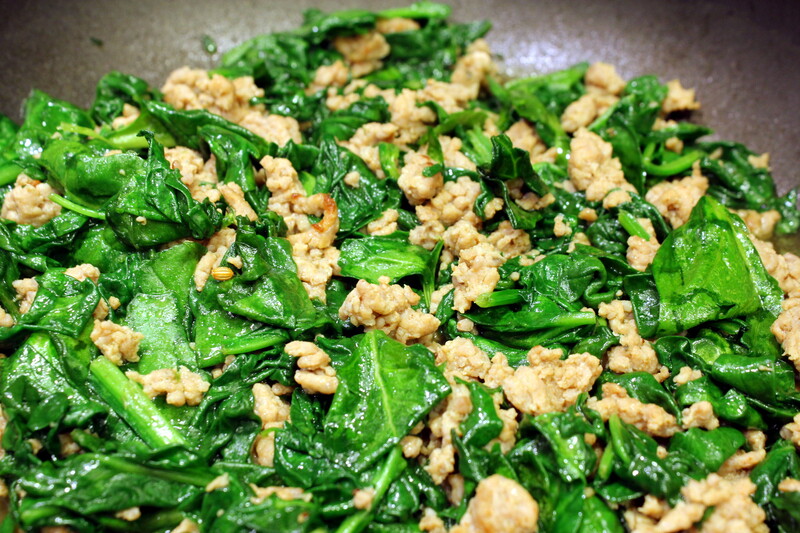 Leaving the sausage in the pan, add 1/4 cup water and the spinach, stirring until wilted. Season with ground pepper, to taste. 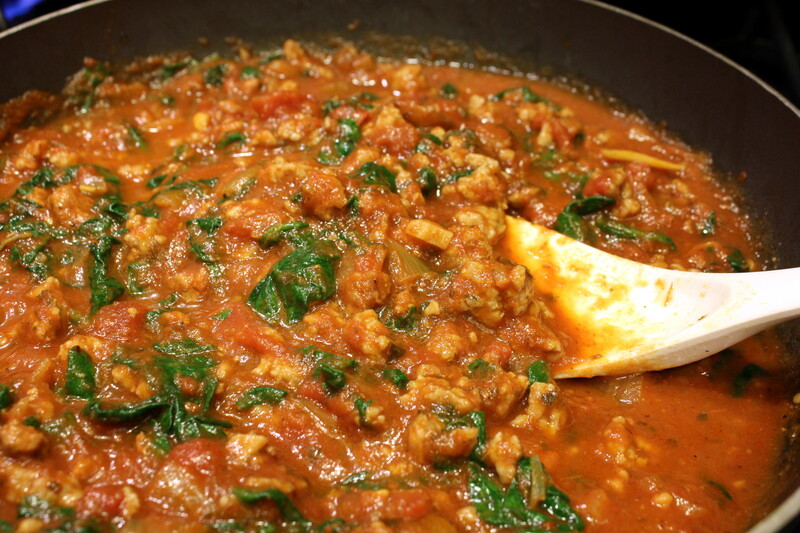 Add the spaghetti sauce to the skillet, combine, and bring to a simmer. 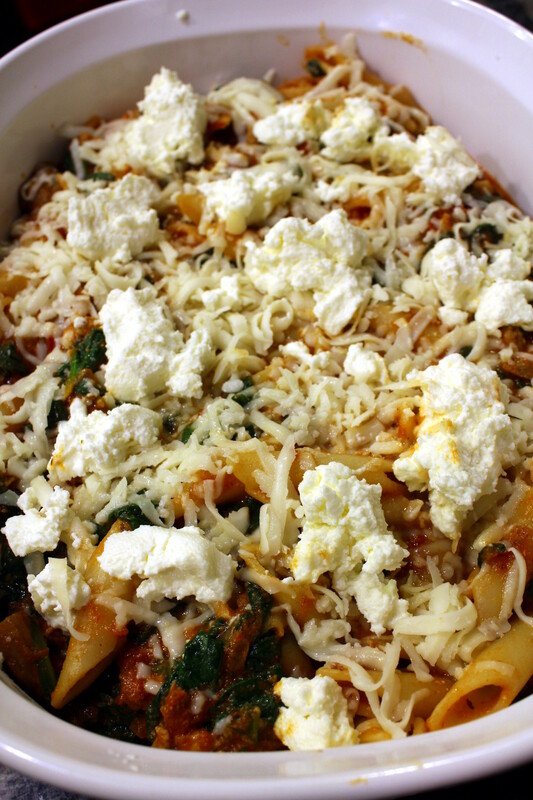 Pour into a large casserole dish (or leave in in the skillet if using cast-iron), then stir in the cooked pasta, half the mozzarella and half the ricotta cheese. Sprinkle with the rest of the mozzarella and place dollops of the remaining ricotta over top. Place in oven for about 10 minutes, then turn the oven to broil and cook until golden brown on top, about 5 to 7 more minutes. Serve immediately. WOW, so much flavor for so few ingredients! Add 2 layers of cheesecloth (I used meshed cotton veggie bags) over a sieve or strainer on top of a bowl. Pour the milk and cream into a saucepan and bring to a full boil, stirring occasionally. Watch it carefully so it doesn’t overboil! Turn off heat and stir in the vinegar or lemon juice and let it sit for a few minutes. 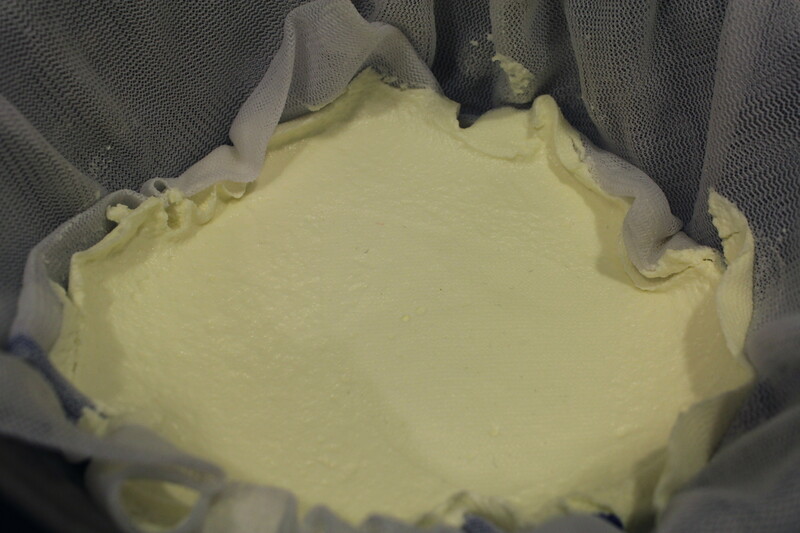 Pour the mixture over the cheesecloth and allow it to drain for about 25 minutes. Then place in refrigerator for several hours or overnight. Store unused cheese in a tightly sealed container in the refrigerator. wow – this is very healthy, rich ingredients, strong flavor. Did I read it correctly that you just got laid off? I am so sorry! How are you??? That is terrible! What happened? So scary. A typical Reduction in Force near the end of the company’s fiscal year. Terrible and so short sighted. So this happens at the end of the fiscal year and then they rehire on an as needed basis? Brutal! Around here, I cannot tell you the number of highly qualified people there are over a certain age, brilliant and talented and unemployed. It’s very disturbing. This looks great. I will have to try making my own ricotta cheese. It is so good when homemade. I don’t want to get my husband hooked on it though. Thank you! But it’s so darned easy!!! I love this idea Kathryn!! So much easier. Thanks for mentioning me in your post. Next time I’m going to do your version! I hope your doing ok. Loosing a job is never easy, but I am always a firm believer that there are better things to come. Thank you so much Debbie. I had been there since 2001 so it’s like losing a bunch of friends, too. But I am optimistic! Thanks Stacy! Now that’s pretty cool! These meatballs had the spinach mixed into them, though. Looks very tasty – thanks Kathryn. This looks sooooo delicious! I’m so sorry to hear about you getting laid off. I hope it doesn’t cause too great of a hardship and you get to enjoy the time. I like the idea of homemade ricotta too btw. I like easy. I love easy-delicious. Eureka! — As for the layoff, I’m sorry. I know you’ve heard it a million times already and I believe it to be true: One door closes … another opens. I have no doubt you’ll land on your feet. Thank you Adam. This is my second layoff from this company (the other one was 3 years after I started there). We’ve had layoffs probably every year for 5 years running now, so not totally surprising. And YES, you should try this. A perfect recipe for the Jimmy. Kathryn, you are amazingly creative. This sounds like another winner. Mega hugs! Woah… hold on. I missed the layoff comment, had to go back. I’m so sorry. I know that is hugely stressful. Been there. I believe with all my heart that you will be just fine. Here’s another great big hug. Thank you Judi! A good store bought ricotta works just as great. And yeah, it’s all a bean counter thing at this time of year, nothing personal, right? This is my kind of dish! Your recipe for ricotta makes it very doable. Thanks Chef, I hope you enjoy it! Delicious! I love using Italian sausage in pasta sauces – it’s my go-to when I can’t be bothered to make meatballs! This sounds amazing, Kathryn. I love all the ingredients and it sounds like something I can cook. I never knew that ricotta was so easy to make. I’m going to have to try it. What a treat. Thank you Diana, and it is SO easy too! Homemade ricotta is the best. I like it for breakfast with berries. Thanks for sharing your recipe. You are most welcome Bernadette! 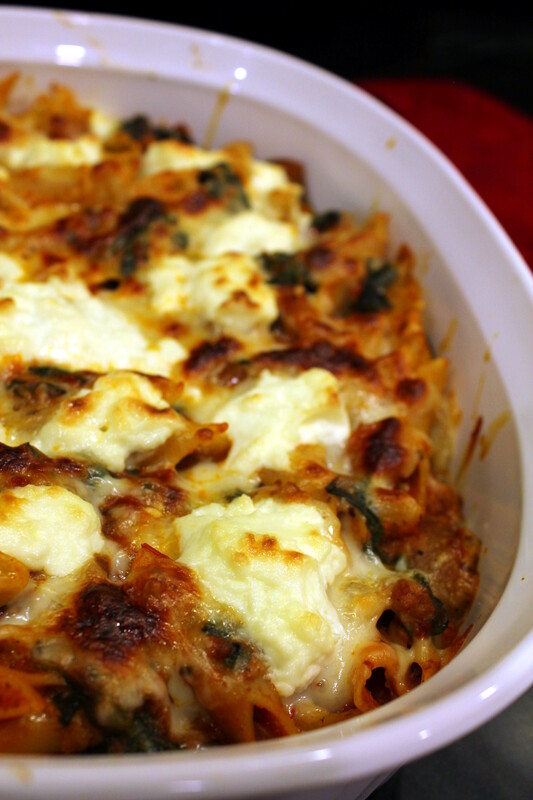 I love a pasta dish like yours and all the ingredients, especially the homemade ricotta. I am so sorry that you got laid off. Hopefully you get a better job. You would mak a great full time blogger. That’s awesome Lynne, thank you! This is great. I didn’t know ricotta cheese sounds easy to make. And it is really good, too! Thanks Karina! I just live your recipes. They’re so good and easy to follow with easy to find ingredients. Looks delicious Kathryn, you have inspired me to make some ricotta. Going to do it tomorrow. Now I’m hungry!! You should, it is SO easy! Thanks! I’ve never made homemade ricotta! This looks hearty and delicious. SO sorry about Friday. UGH. Maybe it is a sign that you should write a cookbook. Kathryn’s tips and tricks to spicy and savory treats! Great photos. I can taste it just by looking at it. YUM! It looks like so much fun to make Ricotta. Until I read this post, I had no idea how easy it is to make. Thanks Sheryl, it’s quite easy! You should try it! That is making me hungry!! Looks so yummy! So hearty and healthy! Looks delicious! You are most welcome, glad to oblige! 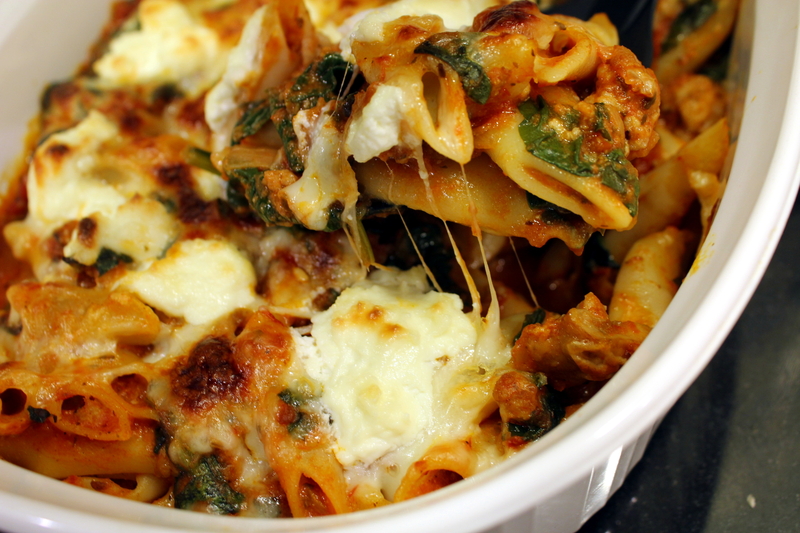 I didn’t have lunch today and this post has made me so hungry…your pasta looks great. I meant to comment earlier but I got all sidetracked because I wanted to compare your home-made ricotta to my mascarpone recipe. Very much alike but the mascarpone is quite a bit richer….I can’t wait to try it because ricotta is SOOO expensive around where the folk’s live and I have to drive into Sioux Falls, which is a huge bummer. I’m going to be making it all the time!! I’ll make this, and I’ve been wanting to make lemon ricotta pancakes…the list goes on!! Regardless the whole dish looks/sounds amazing. 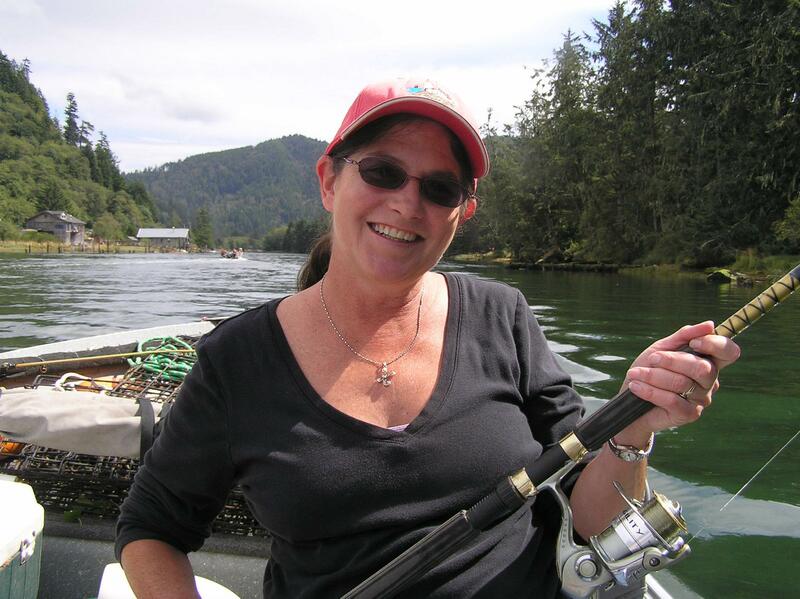 Love Debbie’s blog, too, btw!! Are you sure that’s legal … it looks far too delicious! Bootlegged Pasta is what I’m going to call it when I cook it which I legally have to! This looks wonderful – and I especially love the recipe for homemade ricotta. I knew it was possible but this is the first time I’ve run across a recipe for it. This post is a keeper – thanks for sharing. Thank you so much for such a kind response about the recipe! You would absolutely LOVE the homemade ricotta! I don’t keep that much milk in the house since I never drink it, so I’ll have to shop to try it, but I certainly intend to do so. I love the sound of that ricotta. I had never questioned how it was made before. I shall have to try it. Thank you so much for your kind comment! I was amazed at how easy it was to make and how great it tastes. Thanks so much Tonya! I have something up my sleeve with what I’m going to do next with my life. Stay tuned to my blog! I would love to make my own ricotta! Thanks for the recipe! It’s easy, thank you Kelly!